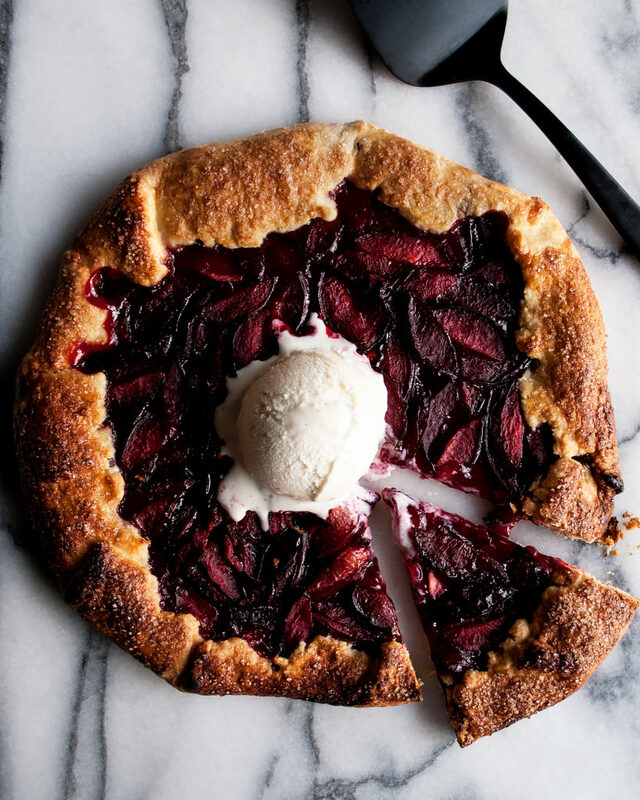 It’s simple, it’s classic, and it’s exactly what you should be making right now: a summer plum galette. 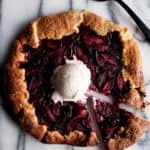 I just love how rustic this plum galette is. Summer is really the time to lighten up on effort and let the seasonal ingredients shine. This galette is one of those recipes that you will feel SO good making. Because it’s relaxed, and honestly just a lot of fun. The dough is made in the food processor and there’s really no reason to worry about it. It’s one of those “no-fuss” doughs that pretty much turns out perfectly every time. One thing to make sure you do is keep your butter and water nice and cold. It helps create that beautiful flaky, yet tender texture. From there, all you need to do is find a farmer’s market and pick up some plums. They are everywhere right now…all sorts of colors and varieties. 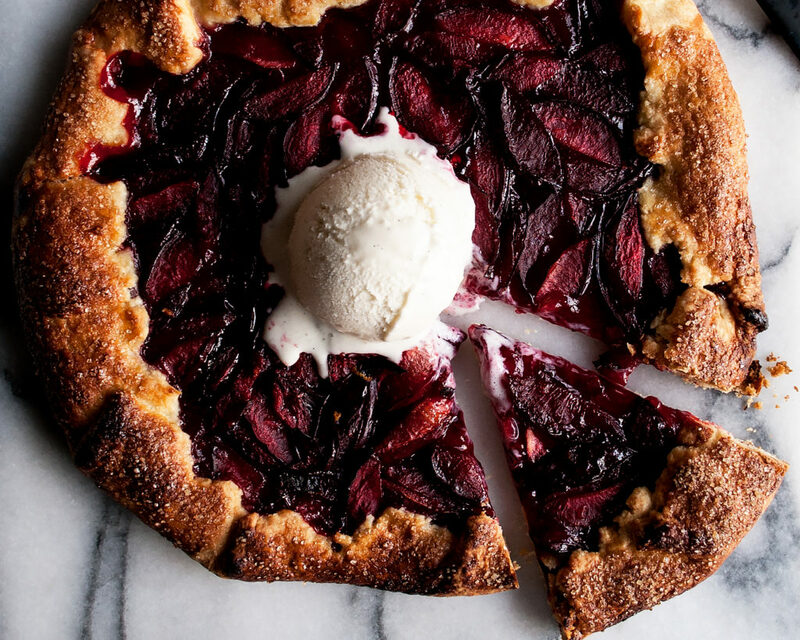 I just love these dark red plums in this galette, but any type would work. Ah, you are going to love it. And trust me, there is nothing better than the smell when this comes bubbling out of the oven. PS…ice cream is kind of required, too. 1. Add the flour, sugar, and salt to a food processor. Pulse until combined. 2. With the processor running, gradually add the cold butter until the mixture resembles coarse crumbs. 3. Stream in the cold water. The dough should come together and pull away from the sides. 4. Transfer the dough to a clean surface and shape into a disk. Wrap with plastic wrap and chill for 45 minutes. 1. Preheat the oven to 425F. Line a sheet pan with a piece of parchment paper. 2. Combine the sliced plums with both sugars, the cornstarch, lemon zest, and a pinch of salt in a mixing bowl. Gently toss until well mixed. Let sit for about 20 minutes until the sugars are dissolved. 3. Meanwhile, let the chilled dough sit out at room temperature for about 10-15 minutes until soft enough to roll out. Working on a floured surface, roll out the dough to about a 12-inch circle. 4. Transfer the dough to the sheet pan. Arrange the plums in the center, leaving a 1-inch boarder. Fold the edges up and over the plum filling. 5. Whisk together the egg yolk and milk to make an “egg wash”. Brush the edges with the egg wash and then sprinkle the raw sugar on top. 6. Bake the galette for 15 minutes, or until the edges are golden and the fruit is bubbling. Let cool for about 10 minutes before slicing. Serve with ice cream.